The international movement of non-native forest insects is a threat to forest sustainability worldwide. Tomicus species (Coleoptera, Scolytidae) are important pests of pine forest in Eurasia, Europe and the Mediterranean, with the common pine shoot beetle (Tomicus piniperda) reported to be the second most destructive shoot-feeding species in Europe. 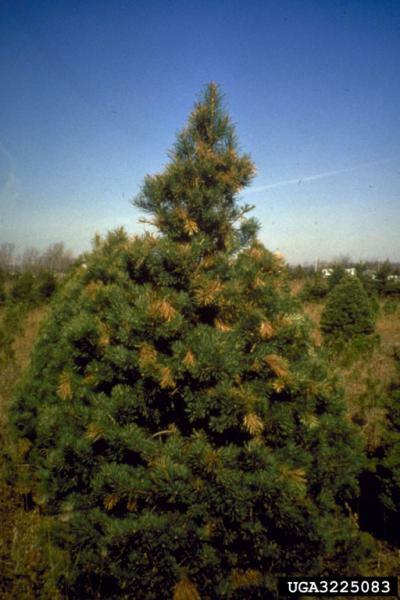 Unlike deciduous trees, which can easily replace their foliage soon after defoliation, conifers are not able to replace their foliage as readily. As such, Tomicus piniperda can permanently destroy the shoots and severely hinder the development of new foliage. Adult common pine shoot beetles (Tomicus piniperda) are 3 to 5mm long, or about the size of a matchhead. They are brown or black and cylindrical. The legless larvae are about 5mm long with a white body and brown head (Plant Protection and Quarantine 1993). The following information may be used in the recognision of this pest (from: Humphreys and Allen Undated). Larvae, pupae and adults can be found at different times in galleries under the bark of dead or stressed trees in spring (usually before native North American beetles emerge). Adults create 2mm holes when exiting tree stems and 2 to 3mm entrance holes when attacking new shoots. First and second year shoots droop and become yellow and red in early summer. Dead shoots from current or previous years may be visable on the ground. Shoots damages by the pine shoot beetle will have 2 to 10cm tunnels and may have circular entrance holes near the broken end. Microscopic features of the pine shoot beetle include: clubbed antennae with a 6-segmented funicle; tootth-like projections on front edge of elytra; on the elytra rows of pits alternate with rows of setae on raised bases; and second row on the declivity has no setae on raised bases. 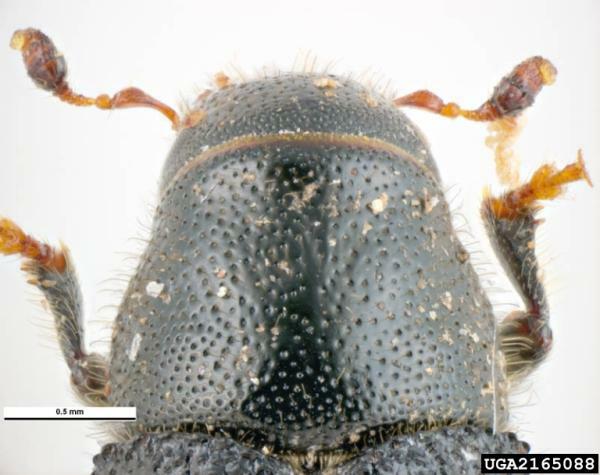 Individuals somewhat resemble individuals of Dendroctonus (southern pine beetle and black turpentine beetle) in general appearance, but the funicle of the antenna is composed of six antennomeres (Thomas and Dixon 2004). T. piniperda can be distinguished from other members of the genus by the smooth second elytral interval on the declivity (Thomas and Dixon 2004). 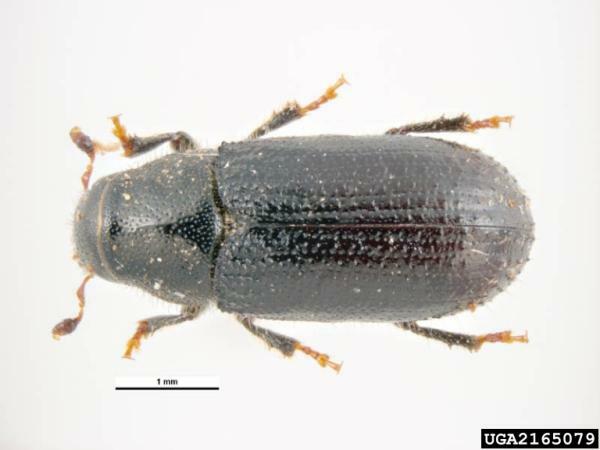 Please see PaDIL (Pests and Diseases Image Library) Species Content Page Beetles: Pine shoot beetle Tomicus piniperda (Linnaeus) (Coleoptera: Curculionidae: Scolytinae: Hylesinini: Tomicina) for high quality diagnostic and overview images. Common pine shoot beetles (Tomicus piniperda) and other species of scolytids use host volatiles such as a-pinene and ethanol to locate suitable breeding material (Schroeder and Lindelöw 1989, in Morgan, de Groot and Smith 2004). Tree vigour may alter the quantity or quality of volatiles released by the trees, which in turn may alter the trees’ attractiveness to T. piniperda (Schroeder 1987, in Morgan, de Groot and Smith 2004). It is likely that the differences in the probability of stem attack between species were due to differences in the relative vigour of the trees. For example, Långström and collegues (1999, in Morgan, de Groot and Smith 2004) reported that T. piniperda attacks on fire-damaged Scots pine trees in Sweden were avoided by all trees carrying at least 40-50% of their foliage. Another study, conducted in southwestern Finland, found that stem attacks by T. piniperda were often avoided on Scots pine trees that retained 10% of their needles after defoliation by Diprion pini (L.) (Annila et al. 1999, in Morgan, de Groot and Smith 2004). This suggests that T. piniperda is a secondary bark beetle species, able to successfully colonise only pine trees that are severely weakened by other predisposing factors. Common pine shoot beetles (Tomicus piniperda) complete only one life cycle per year in North America. They spend the winter months inside the thick bark at the base of living pine trees. The beetles become active and leave their over-wintering sites in March and April to mate and lay eggs in dead trees, dying trees, and recently cut stumps. Adults can fly several miles during this period in search of a suitable host. Females lay eggs in gallery systems they bore between the inner bark and outer sapwood of the tree. Egg galleries are 10 to 25cm long. From April to June, larvae feed under the bark of the tree in separate feeding galleries 4 to 9cm long. Mature larvae stop feeding, pupate, and emerge as adults. From July through October, adults tunnel out and fly to new pine shoots to feed. The beetles bore into the centre of the shoot during maturation feeding, hollowing 2.5 to 10cm of wood. Affected shoots droop, turn yellow, and fall off during the summer and fall. Feeding adults attack living pine trees of all sizes. This is the most destructive stage of the life cycle. When shoot feeding is severe, tree height and diameter growth are reduced (Plant Protection and Quarantine 1993). Unlike most scolytid bark beetles that feed exclusively on the inner bark of their hosts, the pine shoot beetle has two feeding stages. Adults emerge from over-wintering sites in early spring to seek new breeding material in the form of stumps, fresh logs, and broken limbs (Schroeder 1987). Mated females construct egg galleries within the phloem and deposit eggs along the sides of the galleries. After eclosion, larvae consume the phloem and remain beneath the bark until they pupate and subsequently emerge as adults. Newly emerged adults fly to nearby trees where they mine the centres of new shoots for several months, they build energy reserves, and the eggs mature in the females. Maturation feeding has been well documented in Scots pine stands in Canada (Ryall and Smith 2000, in Eager et al. 2004) and in Scots pine Christmas tree plantations in Indiana (Kauffman et al. 1998, Haack et al. 2001, in Eager et al. 2004) and Michigan (Haack et al. 2000 2001, in Eager et al. 2004). A single adult may mine several different shoots during late summer and fall. Intensive maturation feeding may cause shoot mortality and result in growth reduction or some loss of form. Additionally, seed production may be reduced when cone-bearing shoots are attacked. In colder parts of its range, decreasing daylength and freezing temperatures induce pine shoot beetle adults to seek over-wintering sites in the outer bark at the base of trees near the soil line (Langstrom 1983, Petrice et al. 2002, in Eager et al. 2004). Common pine shoot beetles (Tomicus piniperda) frequently infest unbarked pine timber in the forests, railway stations, timber yards and other timber storage areas and spread into surrounding pine forests if no preventive measures are taken (Juutinen 1978, Långström and Hellqvist 1990 1991, in Martikainen et al. 2005). Logging waste and stumps in thinned stands and clearcuts are also favoured by Tomicus spp. (Långström 1979, Annila and Heikkila 1991, in Martikainen et al. 2005). Natural disturbances, such as forest fires, windstorms and defoliating insects, can also create favourable conditions for the breeding of pine shoot beetles which may lead to shoot damage in the surrounding pine forests (Nilsson 1974a; Ehnström et al., 1995, Långström et al. 1997 2001, Annila and Heikkila 1999, Cedervind et al. 2003, in Martikainen et al. 2005). The pine shoot beetle (T. piniperda) seems to prefer sites that have numerous dead and dying pine trees that can be exploited for reproduction (Morgan, de Groot and Smith 2004). These low-vigour sites support large populations of the beetles, which subsequently attack the living shoots of trees, leading to additional stress on the trees and an increased potential for growth reductions (Morgan, de Groot and Smith 2004). In Eurasia, the primary native host for T. piniperda is Scots pine (Pinus sylvestris L.) but T. piniperda is capable of colonising, developing, and shoot-feeding in many North American pine species (Siegert and McCullough 2003). The common pine shoot beetle (Tomicus piniperda) flies in early spring, a flight which is strongly influenced by the maximum daily temperature (with a flight threshold estimated at 12 degrees C in Europe and northeastern US and 13 degrees C in the Chinese Kunming region) (Bakke 1968, Haack et al. 1998, Hui 1991, in Gallego et al. 2004). Reproduction in bark beetles and other insects living in bark or wood is usually limited to dead or weakened trees (Schroeder 1988). Vigorously growing host material is not considered to be suitable for brood production (Schroeder 1987). Male and female bark beetles do not seem to have an aggregation pheromone unlike many scolytids but instead rely on host volatiles to attract both sexes (Loyttyniemi et al. 1980, in Eager et al. 2004; Haack 2006). In particular, T. piniperda respond to the monoterpene hydrocarbons released from pine oleoresin (e.g. Kangas et al. 1965, in Kohnle 2004). This is synergised by ethanol emanating from plant tissue under anaerobic fermentation, and indicates to the beetle a potential breeding habitat (Moeck 1970, Klimetzek et al. 1986, Vite´ et al. 1986, Kelsey and Joseph 2003, in Kohnle 2004). Terpinolene (a monoterpene hydrocarbon present in specific high proportions in the odour bouquet of Scots pine) appears to be of particular importance and is particularly attractive to the pine shoot beetle (Byers et al. 1985, Volz 1988, in Kohnle 2004). The two major groups of Scolytidae are the bark and ambrosia beetles (Haack and Slansky 1987, in Haack 2006). Adult bark beetles tunnel and breed at the bark–wood interface, and their larvae feed primarily on inner bark (phloem) (Haack 2006). By contrast, adult ambrosia beetles tunnel in wood and inoculate the gallery walls with fungi (the “ambrosia”) that serve as food for their larvae (Haack 2006). Tomicus piniperda feeds on both the shoots and the inner bark (phloem) of pine trees (Morgan, de Groot and Smith 2004). Scots pine, Pinus sylvestris L., is the principal host of the beetle in its native range; however, the beetle will breed and shoot feed in most species of North American pines (Schroeder 1987, Sadof et al. 1994, Lawrence and Haack 1995, in Morgan, de Groot and Smith 2004). Insects are often transported on commodities such as nursery stock, cut flowers, fresh food, seed, wood packing material, logs, and lumber (Wood 1977, Siitonen 2000, Haack 2001, Dobbs and Brodel 2004, USDA APHIS 2004a, in Haack 2006).Wood packing material, like crating and pallets, often harbors bark- and wood-boring insects, especially when (1) manufactured from recently cut trees, (2) not treated with heat or chemicals, or (3) bark is retained (USDA APHIS 2000, in Haack 2006). The order Coleoptera (beetles) is the most commonly intercepted order of insects found in association with wood packing material. For example, Coleoptera constituted 84% of the intercepted insects associated with wood in both Chile and New Zealand and 92% in the US (Beeche-Cisternas 2000, Bain 1977, Haack 2001, in Haack 2006). Compiler: IUCN/SSC Invasive Species Specialist Group (ISSG) with support from the Forestry Division (Council Of Agriculture) Taiwan. Recommended citation: Global Invasive Species Database (2019) Species profile: Tomicus piniperda. Downloaded from http://www.iucngisd.org/gisd/species.php?sc=1200 on 21-04-2019. The common pine shoot beetle (Tomicus piniperda) is considered the most serious scolytid pine pest in Europe (Thomas and Dixon 2004). In Europe, losses of 20–45% in annual growth increment and volume have been reported (Långström 1980, Långström and Hellqvist 1991, in Poland et al. 2003). The beetle breeds and lays eggs under the bark of dying or recently killed pine trees (Morgan, de Groot and Smith 2004). Soon after development, the progeny adults emerge and feed by mining the shoots of healthy or weakened pines, causing the shoots to break and fall to the ground. Shoot feeding results in a loss of foliage and has been demonstrated to significantly reduce tree growth (Långström and Hellqvist 1990 1991, Czokajlo et al. 1997, in Morgan, de Groot and Smith 2004). In addition to impairing photosynthetic ability and stunting growth, intensive shoot feeding reduces tree vigour and may predispose the trees to stem attacks (Ye 1991, Annila et al. 1999, Långström et al. 2002, in Morgan, de Groot and Smith 2004). T. piniperda almost exclusively depends on Scots pine (Pinus sylvestris) as a host: emerging adults feed on vital shoots for maturation, causing considerable loss of increment (Borowski 2001, in Kohnle 2004), and mature adults reproduce in slash or logs of Scots pine. In Europe, it occasionally attacks spruce (Abies spp.) and larch (Larix spp.) (Thomas and Dixon 2004). The beetles rarely breed on other conifers (Ratzeburg 1837, Escherich 1923, in Kohnle 2004). In North America T. piniperda readily colonises at least two native pine species and these hosts can support the production of a large number of offspring beetles. Scolytids usually attack stressed or recently fallen host material, but some can attack and kill apparently healthy hosts (Haack 2006). In its native Europe and Asia the pine shoot beetle infests the stems of stressed pine trees (Speight 1980, in Jacobs et al. 2004). The pine shoot beetle is normally considered a secondary coloniser of the stems of trees, but is a primary pest on the terminal shoots where it undergoes maturation, especially in the growing tips. These shoots become hollow, die and can be recognised by the brown foliage and resin holes near the shoot bases (Speight 1980, in Jacobs et al. 2004). The species is considered a pine-damaging bark beetle species in the Mediterranean area and especially in Tunisia (Jamaa et al. 2007). Bark and ambrosia beetles are usually vectors of fungi and other microorganisms that grow in the woody host tissues (Kuhnholz et al. 2001, Kirisits 2004, in Haack 2006). La°ngstro¨m et al. (1993), and Solheim et al. (1993) studied a variety of factors related to possible interactions between pine shoot beetle attacks and tree mortality. Among other conclusions reached was that the pine shoot beetle did introduce fungi into host trees, and that one of these, Leptographium wingfieldii, a highly phytopathogenic fungus, can kill healthy trees (Hausner et al. 2005). The simultaneous presence of Leptographium wingfieldii and Ophiostoma minus (phytopathogenic fungi) in the galleries of T. piniperda and on the insects themselves has already been reported from various regions of Europe: France (Lieutier et al. 1989, Piou et al. 1989), Sweden (Solheim and La°ngstro¨ m 1991), and UK (Gibbs and Inman 1991), demonstrating the large distribution and the generality of this association (Jamaa et al. 2007). However the very low frequency of association of these fungi with T. piniperda, together with the high between-plot variations of O. minus, make the significance of these fungi in the establishment of the beetle on its host trees questionable, similar to the conclusions for Europe (Lieutier et al. 1995, Lieutier 2002, in Ben Jamaa et al. 2007). Preventative measures: Because of growing awareness of the threat posed by untreated wood packing material, new worldwide standards for wood treatment were recently proposed. In 2002, United Nation FAO's (Food and Agriculture Organization) Interim Commission on Phytosanitary Measures imposed a global standard for treating wood packaging International Standard for Phytosanitary Measures No. 15 to stop the spread of invasives, that are now being adopted by individual countries (e.g., USDA APHIS 2004b). 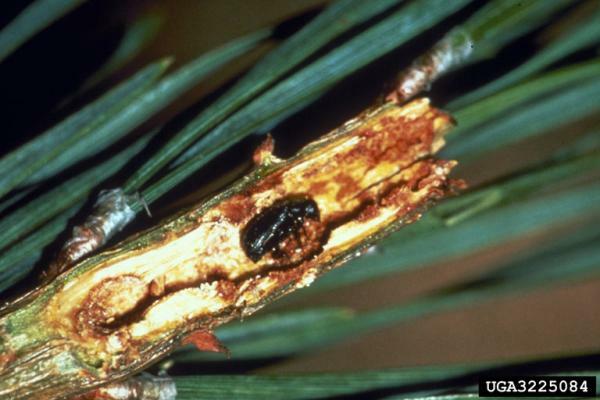 Anticipating severe losses from the pine shoot beetle (Tomicus piniperda), a US federal quarantine was initiated in 1992 (USDA APHIS 1992, in Haack 2006), and a similar Canadian quarantine began in 1993. The quarantines regulated movement of Pinus logs, Christmas trees, nursery stock, and bark from infested to un-infested areas (Haack and Poland 2001, in Haack 2006). Both quarantines were still in effect as of 2005, even though T. piniperda related damage has been low in North America (Morgan et al. 2004, in Haack 2006). Please follow this link for detailed management information for the common pine shoot beetle compiled by the ISSG. Informations on Tomicus piniperda has been recorded for the following locations. Click on the name for additional informations. Czokajlo, D., Ross, D., Kirsch, P. 2001. InterceptTM Panel Trap, a novel trap for monitoring forest Coleoptera, Journal of Forest Science (Prague) 47: 63-65. Summary: Study on the used of the InterceptTM Panel Trap for trapping forest insects. Gallego, D., Ca�novas, F., Esteve, M.A. and Galia�n, J. 2004. Descriptive biogeography of Tomicus (Coleoptera: Scolytidae) species in Spain, Journal of Biogeography (J. Biogeogr.) 31: 2011�2024. Summary: Study on the predictive range of three Tomicus spp. in Spain. Haack, R.A. 2006. Exotic bark- and wood-boring Coleoptera in the United States: recent establishments and interceptions, Can. J. For. Res. 36: 269�288. Summary: A review on interceptions of bark and wood boring beetles in the United States. Haack, R.A. and Poland, T.M. 2001. Evolving management strategies for a recently discovered exotic forest pest: the pine shoot beetle, Tomicus piniperda (Coleoptera), Biological Invasions 3: 307�322. Summary: A review of management strategies targeted at T. piniperda in North America. Haack, R.A., Lawrence, R.K., Petricel, T.R., Poland, T.M. 2004. Disruptant effects of 4-allylanisole and verbenone on Tomicus piniperda (Coleoptera: Scolytidae) response to baited traps and logs, Great Lakes Entomologist 37:3-4. Summary: An North American study on the efficacy of two chemical repellents for repelling T. pinidera in Christmas tree and other pine plantations. Summary: A good overview of the pine shoot beetle threat to Canadian forest ecosystems as well as a description and photos. Kohnle, U. 2004. Host and non-host odour signals governing host selection by the pine shoot beetle, Tomicus piniperda and the spruce bark beetle, Hylurgops palliatus (Col., Scolytidae),JEN 128(9/10). Blackwell Verlag: Berlin. Summary: A study on the fascinating topic of chemical signals effecting host selection by bark-beetles, including T. piniperda. Kolk, A. and Starzyk, J.R. 1996. The Atlas of Forest Insect Pests. Summary: Outlines various control options for T. piniperda. Lebedeva, K.V., Vendilo, N.V., Mitroshin, D.B., Kurbatov, S.A. and Pletnev, V.A. 2006. Application of attractants for monitoring pine shoot beetles Tomicus piniperda and T. minor (Coleoptera : Scolytidae), Agrokhimiya(6): 80-87. Summary: A study on attractants and pheromones of pine shoot beetles and their potential use in controlling pine shoot beetles (via inhibition of attractant compounds). Martikainen, P., Kouki, J., Heikkala, O., Hyva� rinen, E. and Lappalainen, H. 2006. Effects of green tree retention and prescribed burning on the crown damage caused by the pine shoot beetles (Tomicus spp.) in pine-dominated timber harvest areas, J. Appl. Entomol. 130(1): 37�44. Summary: A study on forestry practises and their effect on T. piniperda infestation levels. McCullough, D.G. and Sadof, C.S. 1998. Evaluation of an integrated management and compliance program for Tomicus piniperda (Coleoptera: Scolytidae) in pine Christmas tree fields, Journal of Economic Entomology 91(4): 785-795. Summary: A study on the efficacy of integrated management programmes on the control of T. piniperda. McCullough, D.G., Haack, R.A. and McLane, W.H. 1998. Control of Tomicus piniperda (Coleoptera: Scolytidae) in pine stumps and logs, Journal of Economic Entomology 91(2): 492-499. Summary: A study of the use of insecticides to control T. piniperda. Morgan, R.E., de Groot, P. and Smith, S.M. 2004. Susceptibility of pine plantations to attack by the pine shoot beetle (Tomicus piniperda) in southern Ontario, Can. J. For. Res. 34: 2528�2540. Summary: A study on the factors determining the susceptibilty of pine plantations to infestation by T. piniperda. OEPP/EPPO. 1999. EPPO Summaries of Phytosanitary Regulations: Turkey. Summary: Reference to the prohibition of the importation of T. piniperda into Turkey. OEPP/EPPO. 2000. EPPO Summaries of Phytosanitary Regulations: Iceland. Summary: Regulations concerning phytosanitation in Iceland. Plant Protection and Quarantine. 1993. 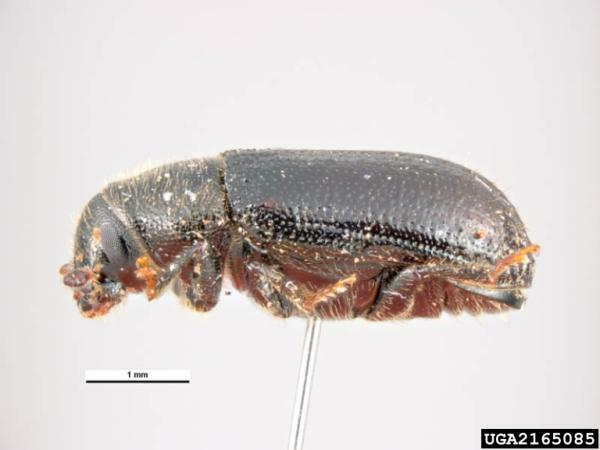 Fact Sheet: Pine Shoot Beetle. Summary: A fact sheet of the efforts of APHIS and state officials to combat the spread of T. piniperda. Poland, T.M., de Groot, P., Burke, S., Wakarchuk, D., Haack, R.A., Nott, R. and Scarr, T. 2003. Development of an improved attractive lure for the pine shoot beetle, Tomicus piniperda (Coleoptera: Scolytidae), Agricultural and Forest Entomology 5(4): 293�300. Summary: A study on attactive lures for the control of T. piniperda. Poland, T.M., Haack, R.A., Petrice, T.R., Sadof, C.S. and Onstad, D.W. 2000. Dispersal of Tomicus piniperda (Coleoptera: Scolytidae) from operational and simulated mill yards, Canadian Entomologist 132(6): 853-866. Summary: A study on the forestry practises, specifically the destruction of old logs, which have the potential to reduce T. piniperda infestations. Siegert, N.W. and McCullough, D.G. 2003. Colonization of Scots, red, and jack pine logs by Tomicus piniperda (Coleoptera: Scolytidae) in Michigan pine stands, Can. J. For. Res. 33: 2238�2244. Summary: A study on the colonisation of native and non-native pine species in Michgan, USA. Sikstr�m, U., Jansson, G., and Weslien, J. 2005. Predicting the mortality of Pinus sylvestris attacked by Gremmeniella abietina and occurrence of Tomicus piniperda colonization, Can. J. For. Res. 35: 860�867. Summary: A look at the association between Gremmeniella abietina and Tomicus piniperda infestations in Swedish Pinus sylvestris plantations. Thomas, M.C. and Dixon, W.N. 2004. Featured creatures: pine shoot beetle, DPI Entomology Circular 354. University of Florida Institute of Food and Agricultural Sciences: Florida. Summary: A general overview of T. piniperda and problems caused by this pest. Walker, K. 2008. Pine shoot beetle (Tomicus piniperda) Pest and Diseases Image Library. Updated on 13/02/2008 10:19:11 PM. Summary: PaDIL (Pests and Diseases Image Library) is a Commonwealth Government initiative, developed and built by Museum Victoria s Online Publishing Team, with support provided by DAFF (Department of Agriculture, Fisheries and Forestry) and PHA (Plant Health Australia), a non-profit public company. Project partners also include Museum Victoria, the Western Australian Department of Agriculture and the Queensland University of Technology. The aim of the project is: 1) Production of high quality images showing primarily exotic targeted organisms of plant health concern to Australia. 2)Assist with plant health diagnostics in all areas, from initial to high level. 3) Capacity building for diagnostics in plant health, including linkage developments between training and research organisations. 4)Create and use educational tools for training undergraduates/postgraduates. 5) Engender public awareness about plant health concerns in Australia. Ben Jamaa, M.L., Lieutier, F., Yart, A., Jerraya, A., and Khouja, M.L. 2007. The virulence of phytopathogenic fungi associated with the bark beetles Tomicus piniperda and Orthotomicus erosus in Tunisia, For. Path. 37: 51�63. Summary: A Tunisian study on phystopathic fungi carried by T. piniperda and another bark beetle. Borkowski, A. 2001. Threats to pine stands by the pine shoot beetles Tomicus piniperda (L.) and Tomicus minor (Hart.) (Col., Scolytidae) around a sawmill in southern Poland, J. Appl. Ent. 125: 489�492. Summary: Polish study on the dynamics of pine shoot beetles near sawmills. Eager, T.A., Berisford, C.W., Dalusky, M.J., Nielsen, D.G., Brewer, J.W., Hilty, S.J. and Haack, R.A. 2004. Suitability of Some Southern and Western Pines as Hosts for the Pine Shoot Beetle, Tomicus piniperda (Coleoptera: Scolytidae), J. Econ. Entomol. 97 (2): 460-467. Summary: Research into the potential impact of T. piniperda on significant pine resources. Hausner, G., Iranpour, M., Kim, J.J., Breuil, C., Davis, C.N., Gibb, E.A., Reid, J., Loewen, P.C. and Hopkin, A.A. 2005. Fungi vectored by the introduced bark beetle Tomicus piniperda in Ontario, Canada, and comments on the taxonomy of Leptographium lundbergii, Leptographium terebrantis, Leptographium truncatum, and Leptographium wingfieldii, Can. J. Bot. 83: 1222�1237. Summary: Study on the potential of T. piniperda to vector phytopathogenic fungi. Jacobs, K., Bergdahl, D.R., Wingfield, M.J., Halik, S., Seifert, K.A., Bright, D.E. and Wingfield, B.D. 2004. Leptographium wingfieldii introduced into North America and found associated with exotic Tomicus piniperda and native bark beetles, Mycol. Res. 108(4): 411�418. Summary: An in depth look at a species of phytopathogenic fungus carried by T. piniperda. Kim, J., Lim, Y.W., Breuil, C., Wingfield, M.J., Zhou, D. and Kim, G. 2005. A new Leptographium species associated with Tomicus piniperda infesting pine logs in Korea, Mycol. Res. 109 (3): 275�284. Summary: A study on fungal infestations of pine logs in Korea infested with Tomicus piniperda. Rabaglia, R.J. 2003. Annotated list of the bark and ambrosia beetles (Coleoptera: Scolytidae) of Maryland, with new distributional records, Proceedings of the Entomological Society of Washington 105(2): 373-379. Summary: Distribution record for this species in Maryland, USA. Ryall, K.L. and Smith, S.M. 2000. Brood production and shoot feeding by Tomicus piniperda (Coleoptera: Scolytidae), Canadian Entomologist 132(6): 939-949. Summary: A study of over-wintering behaviour of T. piniperda in Ontario. Ryall, K. L. and Smith, S.M. 2000. Reproductive success of the introduced pine shoot beetle, Tomicus piniperda (L.) (Coleoptera, Scolytidae) on selected North American and European conifers, Proceedings of the Entomological Society of Ontario 131: 113-121. Summary: A study on the potential infestation of native pines by T. piniperda. Schroeder, L.M. 1988. Attraction of the bark beetle Tomicus piniperda and some other bark- and wood-living beetles to the host volatiles a-pinene and ethanol, Entomol. exp. appl. 46: 203-210. Summary: A study on the attraction of T. piniperda to various volatiles and the significance of this for reproduction. Ye Hui. 1999. Studies on attacks by Tomicus piniperda (Col., Scolytidae) on Yunnan pine trees (Pinus yunnanensis), Acta Entomologica Sinica 42(4): 394-400. Summary: A Chinese study on the damage caused by T. piniperda.